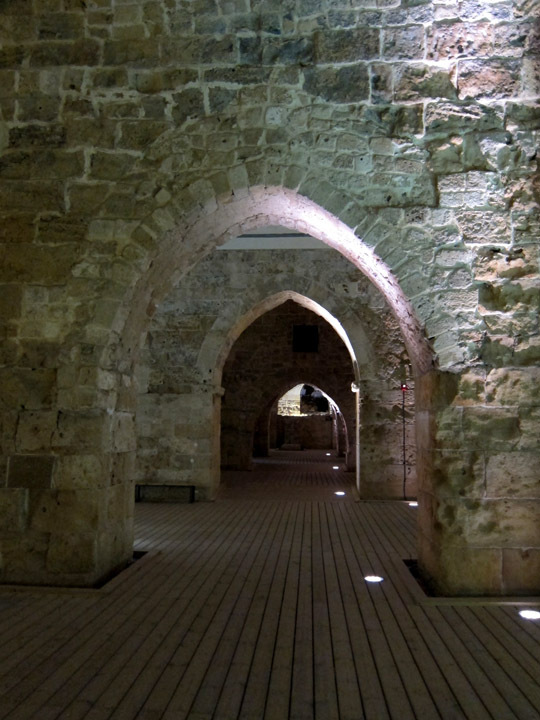 For approximately the 12th and 13th century, Acre (or Akko) served as the capitol of the Crusader kingdom of Palestine. A valuable port city on the Mediterranean, Acre received soldier and supplies as waves of European warriors landed. This city also prospered as a trading hub between Europe and the near East. The old city of Acre and the Crusader structures therein are well preserved and provide a glimpse into this bloody period of history. But what I found in Acre was a well established historical city with elegant architecture suggesting a more stable community during a very violent period in the region. As the capitol of the European province of Palestine, the Crusaders constructed elaborate municipal and public structures in Acre. Luckily for us, subsequent residents decided to build around or on top of the Crusader era structures and so they are in great condition today. During my visit, museum exhibits were being installed in the major Halls. By the end of the year, the beautiful stone walls and vaulted ceilings will be brought to life by interactive and narrative displays about the Crusades. Judging from the completed parts I saw, it will be a great museum! 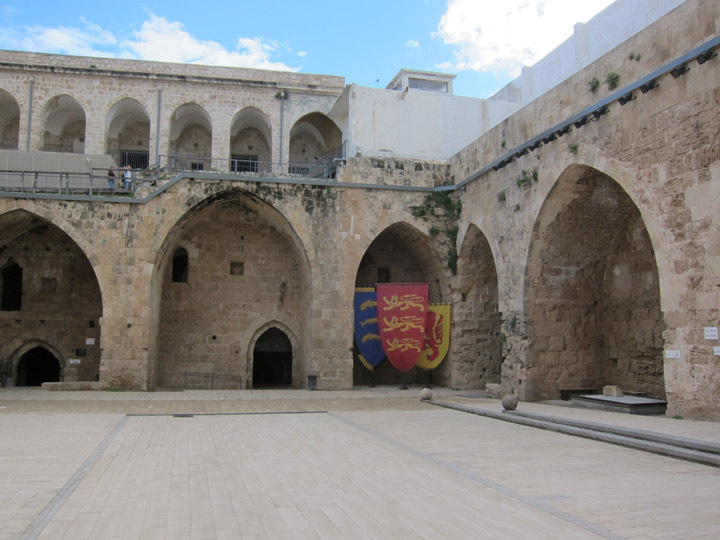 The Crusader City as it is known today is a large complex constructed mainly by The Knights Hospitaller – a religious military order depicted as much to protecting pilgrims as to securing the Holy Lands for Christianity. While the entire city was surrounded by heavy fortifications, there was a central Crusader stronghold. 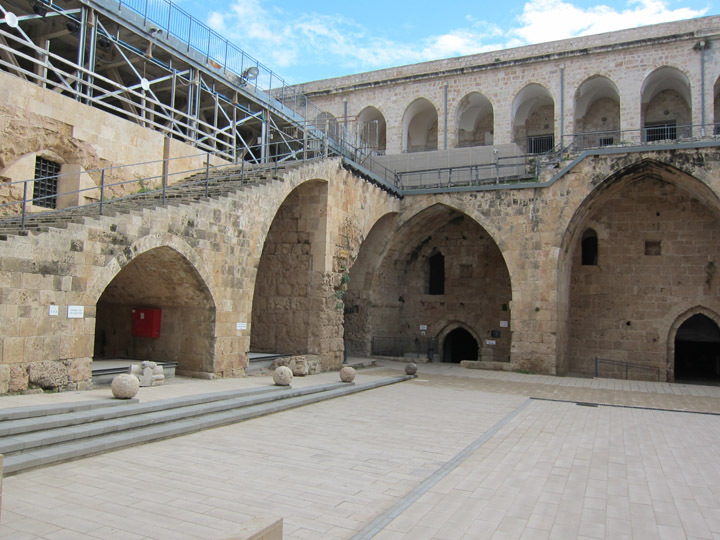 A massive courtyard was surrounded by a dining hall, storage, and living quarters. I was surprised by how well constructed the expansive were. The high-ceilings created a comfortable airy space. 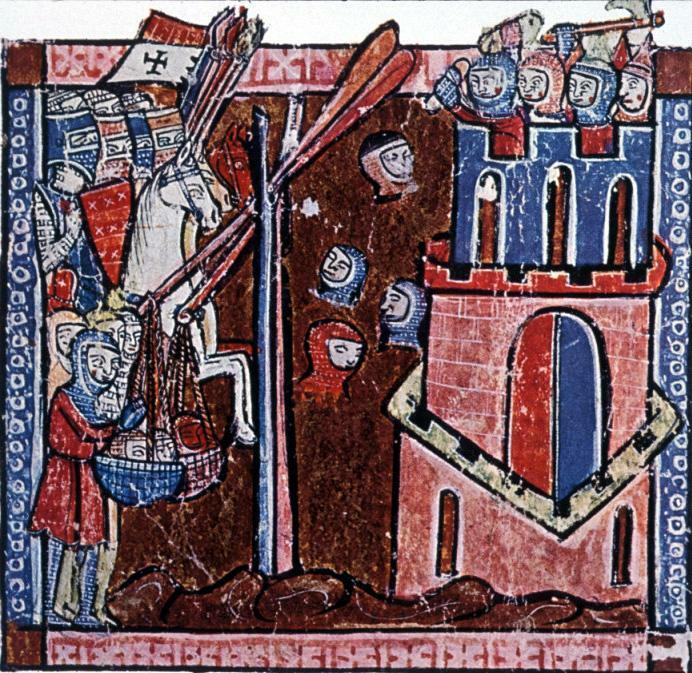 The Crusades were not just field camps and outdoor cooking fires. 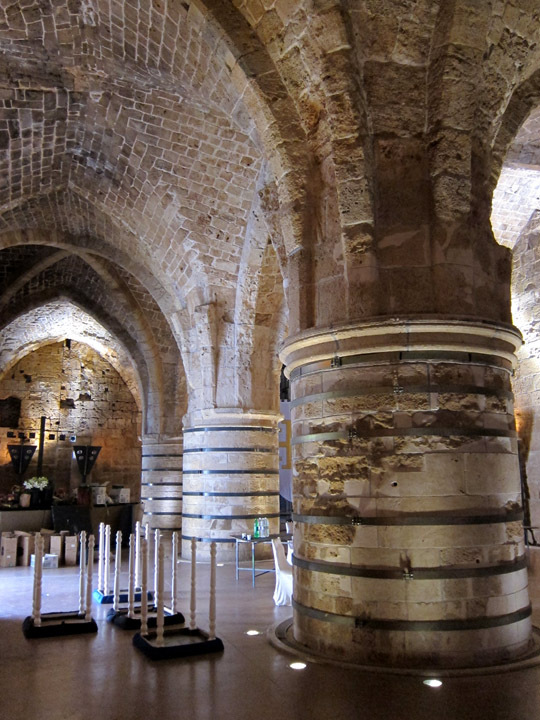 In Acre we see the importation of the Romanesque building style plus the construction of elegant and very permanent buildings. The most famous room, the Dining Hall, has wonderful the rib details to the vaults and massive supportive columns. The space reminded me of some of the private rooms in Mont St. Michel. Apparently I’m not the only you liked this space; a party company was already setting the room up for an event that night. A very small underground tunnel was used to connect the main fortification with the chapel, additional quarters and a hospital. The passageway was tiny! The picture below shows the most expansive section. I crouched through most of the tunnel but at least then I was able to appreciate the shiny mineral deposits on the passage walls from centuries of dripping ground water. Needless to say a new outside route has been constructed to connect these areas to make the museum more accessible (and comfortable!) for visitors. 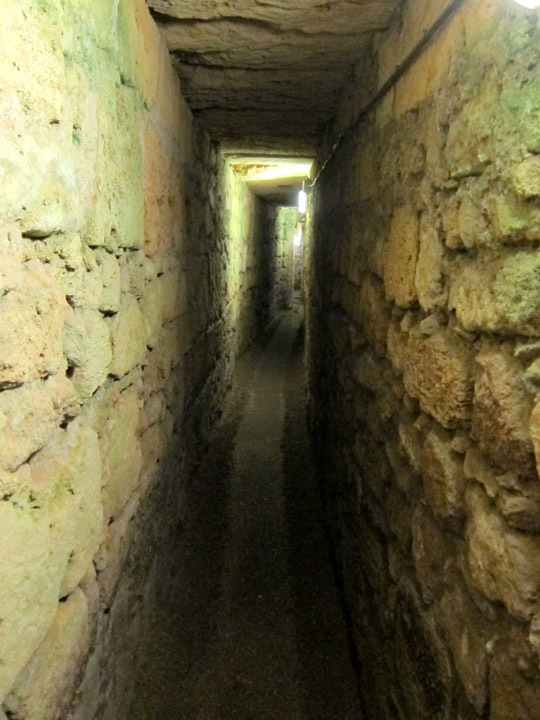 Another tunnel connects the Crusader fortress with the sea. Given that this was the main supply line for the Crusaders, two very broad routes were constructed. 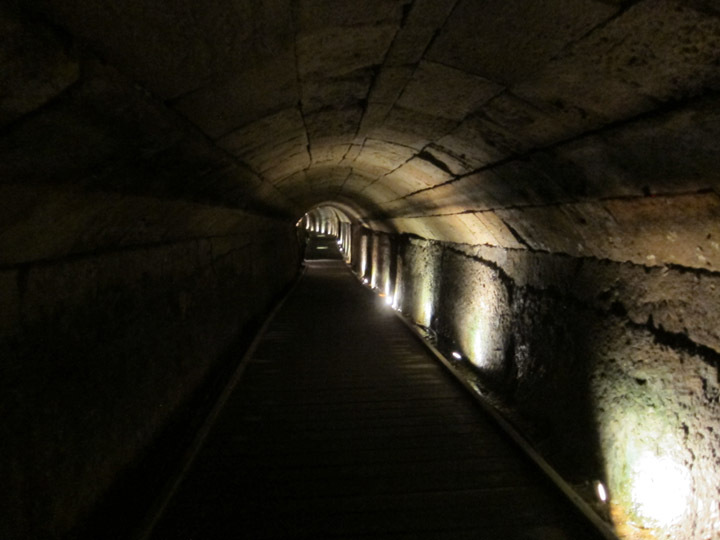 As part of the Crusader Museum, the ocean tunnels section had been recently redone and contained projected illuminated manuscript images and artifact niches. 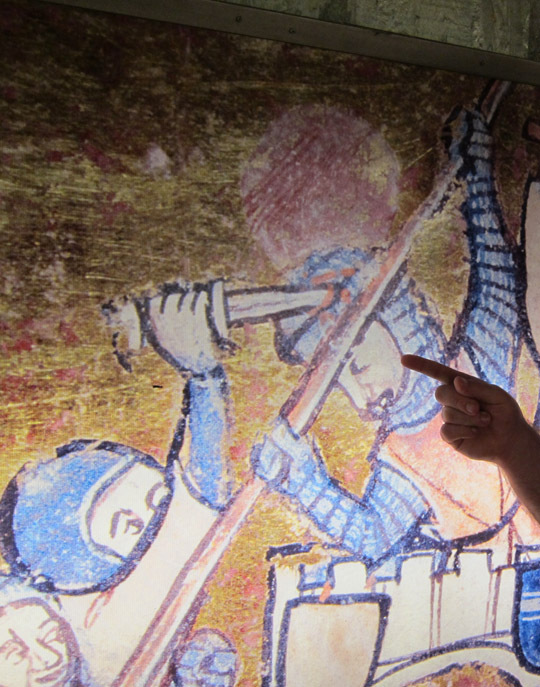 Projections of illuminated manuscript images tell the story of the Crusades with some of the gory details. 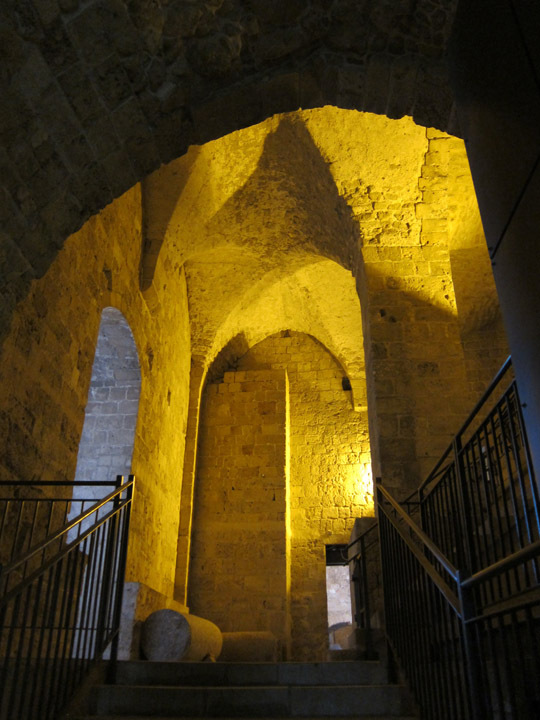 A series of video stations described life in 12th century Acre. The city was divided into ethnic quarters so that the French, German, and other populations could establish their own neighborhoods complete with traditional decorations and food. The stylized Medieval European animation inside the tunnels was gorgeous and created a great visual reference for thinking about this historical period. The animations also referenced famous illuminated manuscript images which was a nice treat for this lover of medieval art! 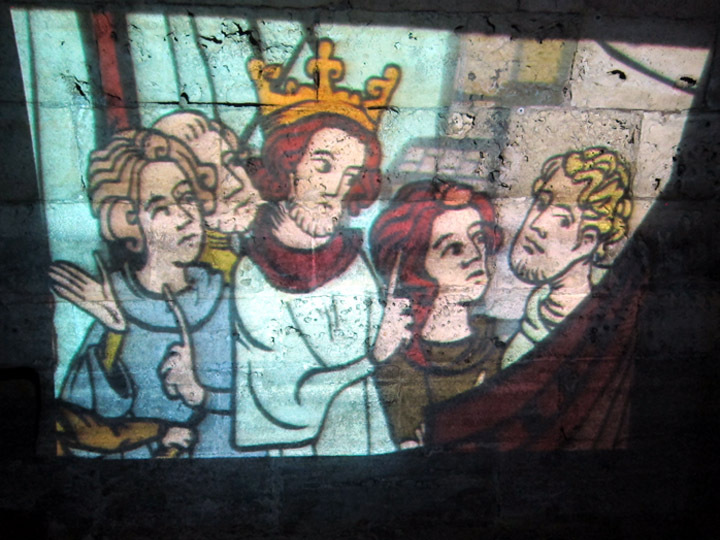 This projected animation tells the story of King Louis IX of France (1214 – 1270) and references a famous manuscript image. My only compliant is that it nearly impossible to find the entrance to the Crusader City. The fortress and tunnel entrances were essentially hidden. Given how small the old city of Acre is, I ran through the entire historic district following signs that made no sense before stumbling across the correct, albeit random, entrances. Signage was also non-existent in the Crusader City, but I think once the new museum is completed this shouldn’t be a problem anymore. 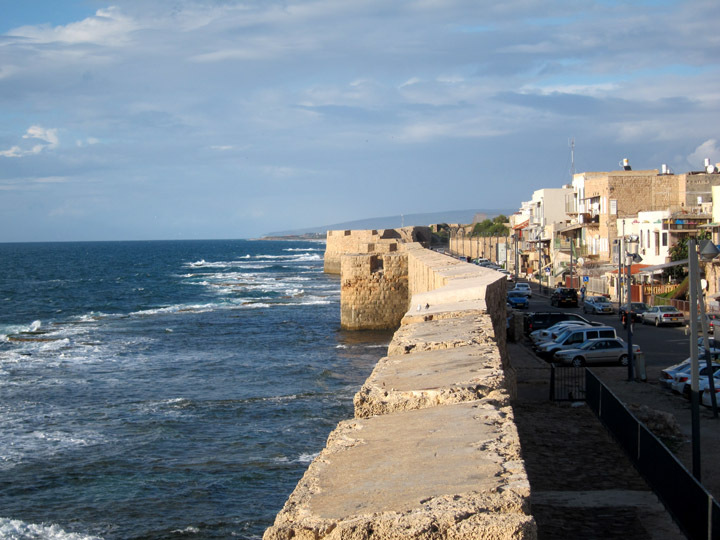 If you’d like to see another slice of Israel’s history (which literally looks surprisingly similarly to European history), definitely make the day trip to Acre/Akko/Acco! What a fascinating journey through the past and present my friend! I love to travel like this all the while learning about the past as well as soaking up the present-day culture! Fantastic job! Thanks! You don’t have to dig very deep to find historical Acre. The compactness of the old city makes it so easy to explore!